Tom Marine and Christine Relton are creators of semi-abstract representational artworks. The married couple have been working together under the name Relton Marine since 1996. Inspired by the American Expressionists and the Fauvists (specifically Matisse) respectively, Marine works in colour blocks for the underpainting and Relton works on the still life or landscape overpainting. Christine Relton (b. 1959) was born in Cumbria and studied at Jacob Kramer in Leeds as well as gaining a Fine Art degree from Lancaster. She is widely travelled having worked as an English teacher, with these experiences feeding into her practice in her choice of subject and colour. Tom Marine (b. 1956) is originally from Hartlepool and was tutored in Fine Art at Byam Shaw and Chelsea College of Art. Alongside his work with Christine he provides 3-day children’s workshops in printmaking and paint that result in an artwork for the host school. Like chalk and cheese, Relton and Marine are opposite ends of the spectrum in the application of their talents. Relton is more deliberate with her painting technique but is much faster in application where Marine is more impulsive but much more patient. They begin together with a discussion of what they imagine for the artwork, considerations of size, ideas and colours are paramount. Following this Marine primes and stretches the canvas then commences the underpainting. The painting then passes to Relton who begins the overpainting. There are then further discussions about how to finish. 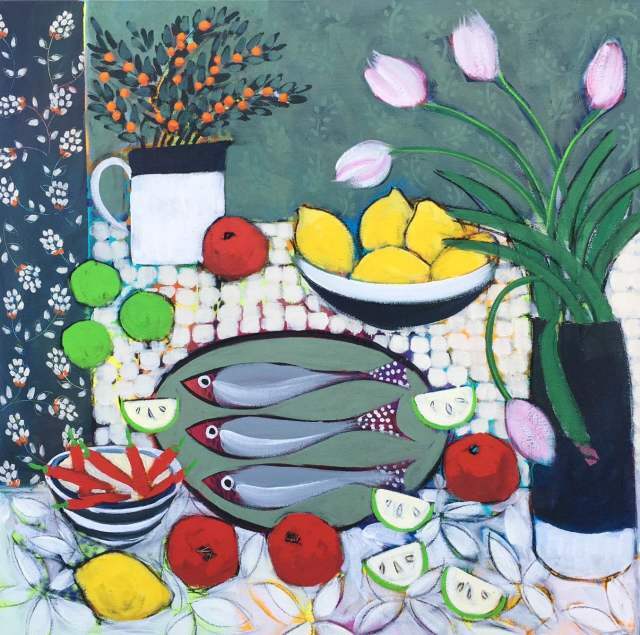 This artistic couple work mainly in acrylic but use textiles (like lace they pick up on their travels) to create the print-like patterns that can be clearly observed in their still life. Another method used regularly is sgraffito, where the top layer of paint is scratched away to reveal the layer underneath. These and other techniques are discussed at the formative stage but significant changes are still employed further into the painting process. Relton Marine hope the result is an uplifting escape from the world. Their works can be found in both public and private collections in North America, Asia and Europe including the House of Lords, England. Traveling is an important part of their research with inspirations from Japan, Vietnam, India and Greece. One of the highlights for Relton Marine is knowing their work is well received internationally to be able to paint with cross cultural resonance. It is for this reason that the ART Salon is proud to represent them worldwide. The ART Salon regularly exhibits their work at international art fairs. They are also published in the Dictionary of Artists in Britain since 1945 by David Buckman, and in the 35thedition of Who’s Who in Art. Occasionally they can be found giving lectures to Fine Art students about their lives as full-time practicing artists and how they manage and commit to that.